Mike Byers has been a professional numismatist for forty years. He is one of the largest dealers handling U.S. & World Gold Coins, Patterns and Rarities certified by PCGS and NGC. He has handled major coin collections and attends every major coin convention. Mike Byers carries an extensive inventory as well as solicits want lists and is always looking to purchase fresh inventory and collections. Mike Byers was a consultant to ANACS for Mint Errors from 2000 to 2006. He is also the Publisher and Editor of Mint Error News Magazine and the Mint Error News Website that was founded in 2003. 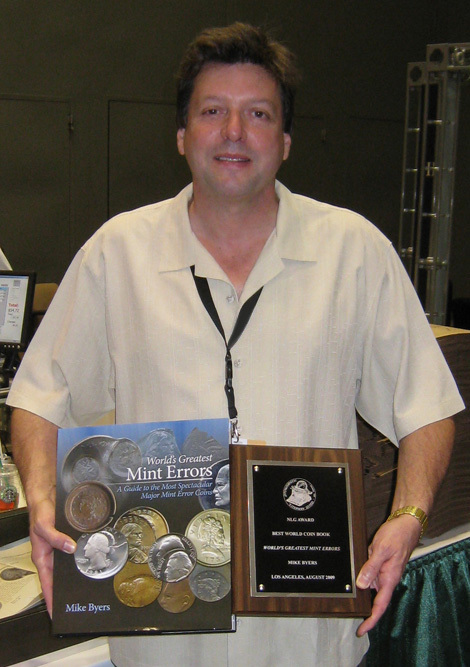 In 2009, Mike Byers published his first book, World's Greatest Mint Errors, which received the NLG Award for Best World Coin Book and is available on Amazon.com. In 2016, Mike Byers was featured on Fox News in an interview with one of his unique mint errors. Mike Byers is a life member of ANA since 1985, a charter member of NGC and a featured dealer/member of PCGS. He is also a life member of the Central States Numismatic Society, the Florida United Numismatists and a member of ICTA. He is member A71 in the Certified Coin Exchange (CCE) and a member of CDN Exchange (BYRS). 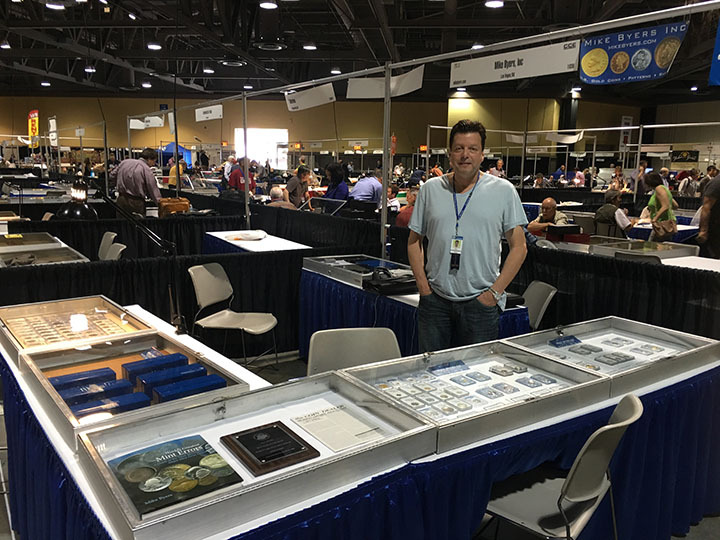 Mike Byers was born in the coin business attending coin shows since he was six years old. When he was seventeen, he issued his first coin catalog. He has been a Market-Maker in U.S. Gold Coins and a dealer in major mint errors. 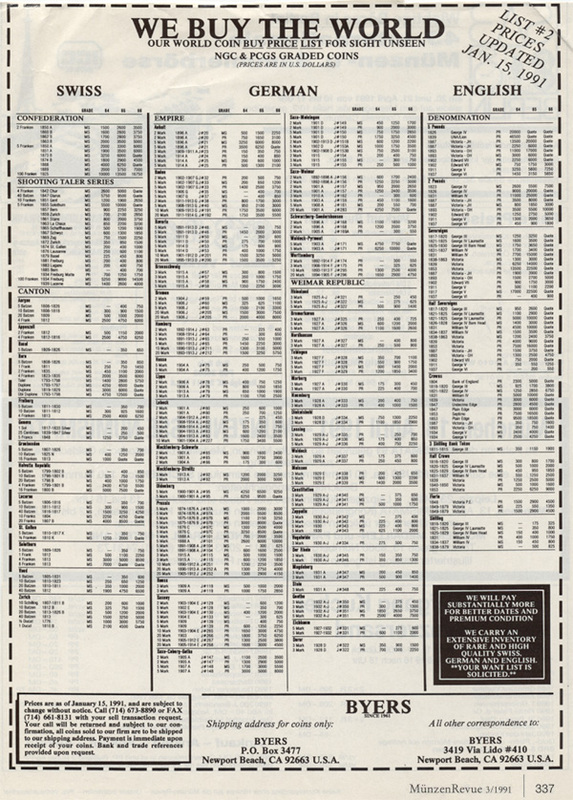 In 1987 he offered limited partnerships and rare coin funds. He has written articles for The Coin Dealer Newsletter and has been featured on the front page of Coin World numerous times with his numismatic rarities. Mike Byers is a contributing author on mint errors for CoinLink & CoinWeek. He also assisted with the mint error section of Coin Facts on the PCGS website. You can visit Mike Byers and view his rarities at the ANA, Central States, FUN show and the Long Beach Coin Expo. 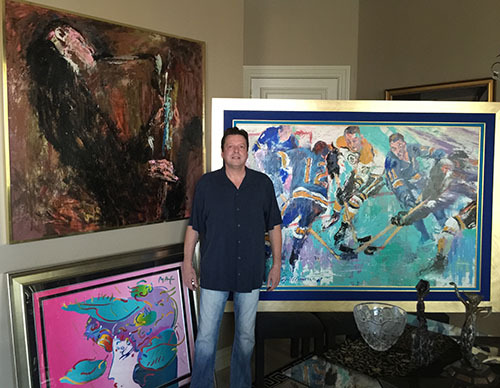 Mike Byers also deals in fine art including Leroy Neiman original oils as well as works by other renowned artists. 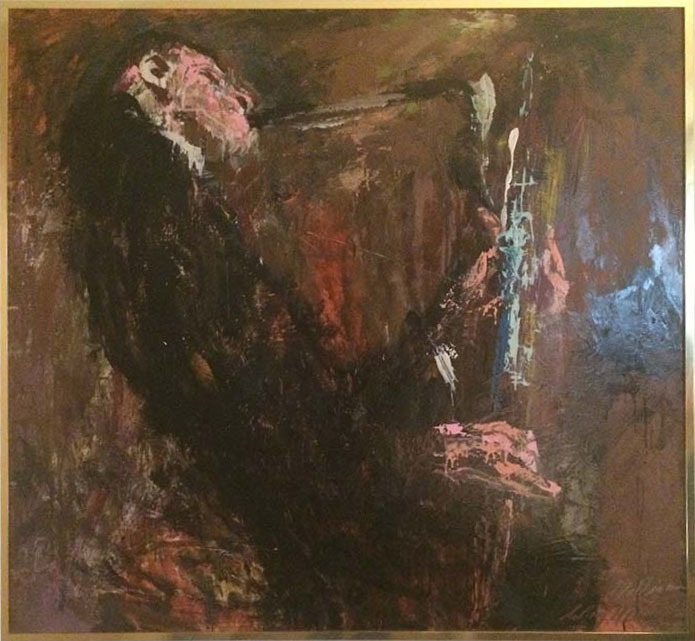 He buys and sells oil and acrylics on canvas and board, bronzes, watercolors and mixed media artwork. 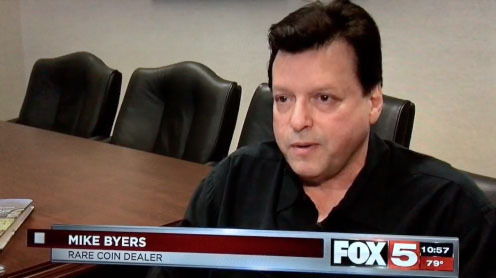 In 2016, Mike Byers was interviewed in a Fox News segment showcasing his unique 1970-S Proof Quarter that was struck on a 1941 Canadian Quarter. 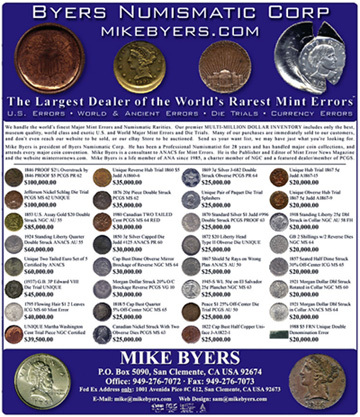 In 2009, Mike Byers published his first book, World's Greatest Mint Errors. This book combines stunning imagery with the most accurate information available to provide anyone interested in mint errors with the latest information on mint error coins from the United States and around the world. Click here for more information and to purchase. 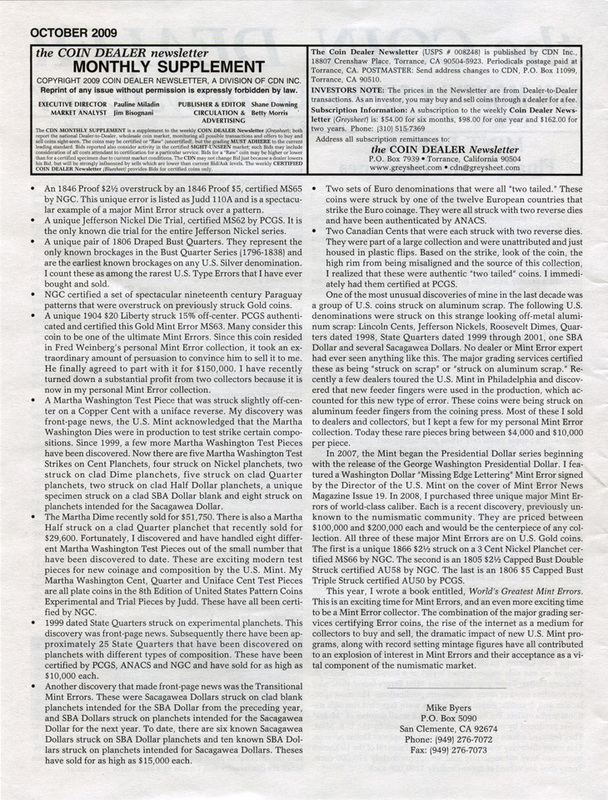 Mike Byers was the featured author in the October 9, 2009 issue of The Coin Dealer Newsletter (Vol. XXXIV No. 10) with a front-page article on mint errors. In 2003, minterrornews.com was launched. 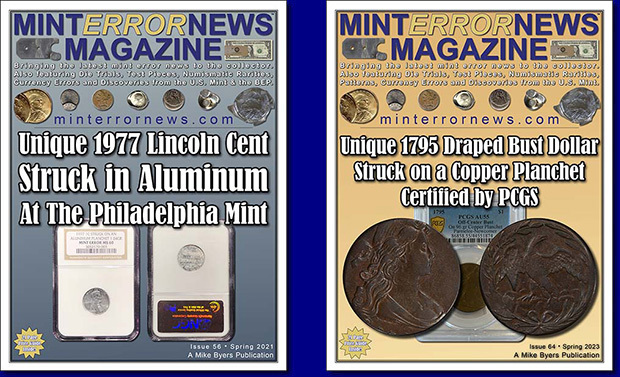 It is a website devoted to bringing the latest mint error news and information to the collector. There are now hundreds of articles with features, discoveries, news stories, and mint error related info from the United States and around the World. 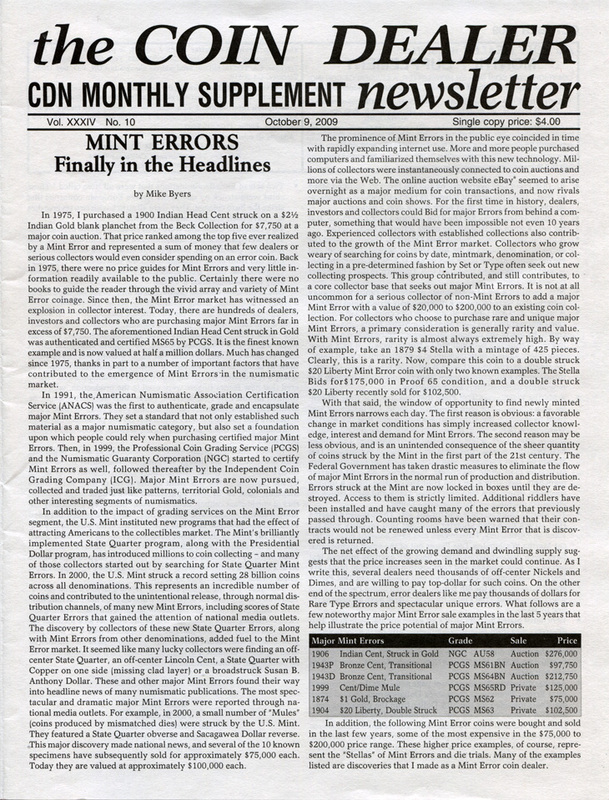 This website became so popular that a print version, Mint Error News Magazine, was created and is read by thousands of readers. 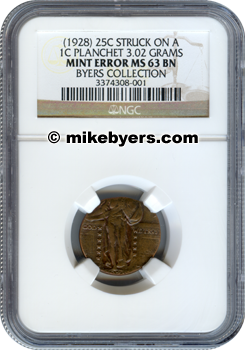 NGC began certifying a few major mint errors from Mike Byers' personal collection. 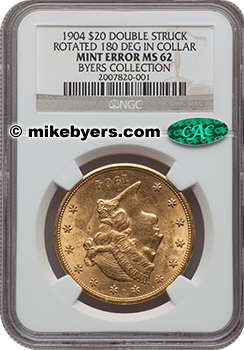 These spectacular and rare coins each have "BYERS COLLECTION" designated on the NGC insert. 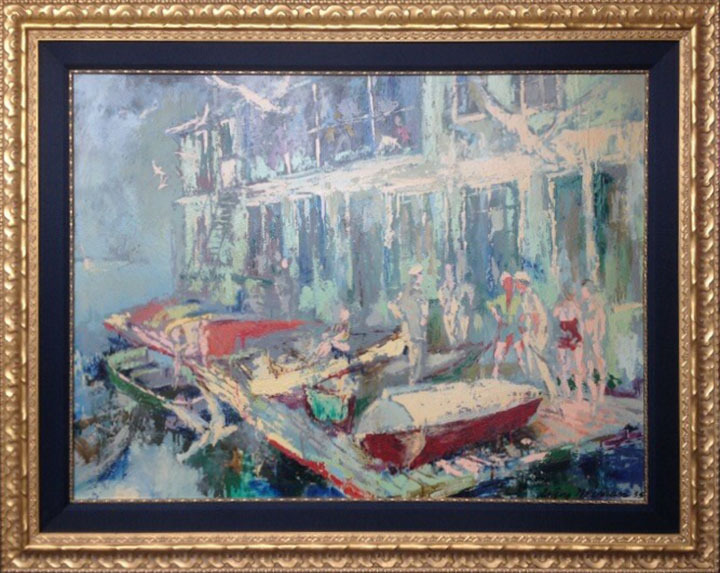 We buy & sell ORIGINAL Leroy Neiman Oil Paintings!! 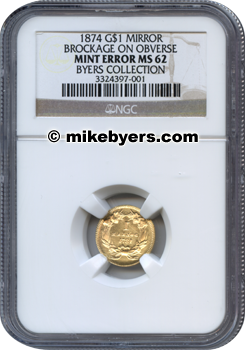 Mike Byers Inc is one of the largest Numismatic corporations dealing in U.S. Gold Coins, Patterns and Rarities certified by PCGS and NGC. 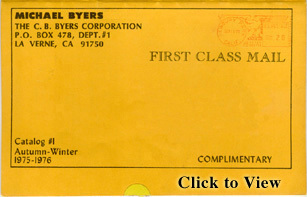 Mikebyers.com was launched in 1999 and today it is considered the most widely viewed and informative numismatic websites specializing in PCGS or NGC certified Pre-1840 Gold Coins, Patterns or Early Type Mint Errors (Pre-1950). Since 1990, Mike Byers has traveled extensively in Europe purchasing the finest quality World Coins. We specialize in Swiss, German and English rarities in the finest quality obtainable. Here's an example of a full page ad in the European Coin Magazine, Munzen Revue. We buy many high quality World rarities. 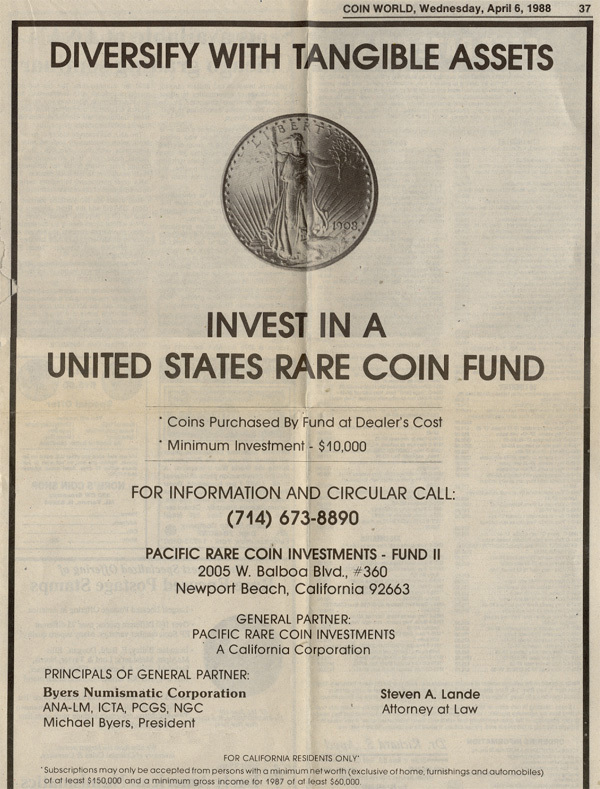 In 1987, Mike Byers was one of the FIRST major U.S. dealers to offer SEC approved Limited Partnerships / Rare Coin Funds. We purchased major rarities including proof gold, early type gold, and gem mint state gold. Our ads soliciting investors appeared in the Wall Street Journal, Coin World, and other publications. Later on, many coin dealers followed our lead and offered Limited Partnerships as well. Mike Byers has purchased millions of dollars of rare United States gold coins and collections. 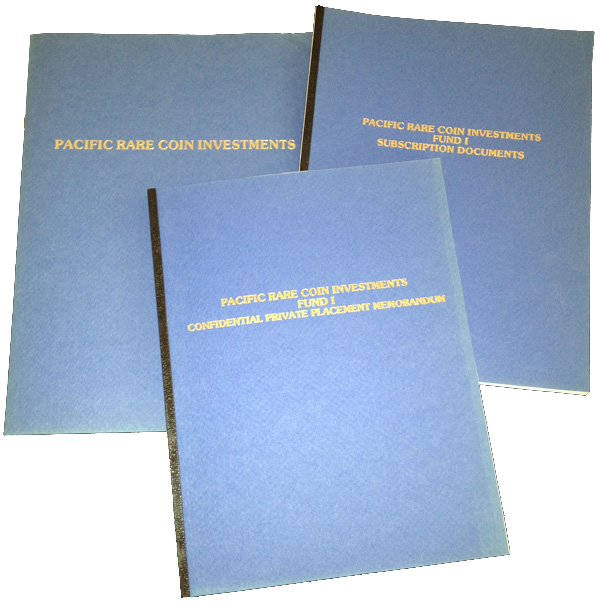 For over 35 years we have been Market-Makers in U.S. gold coins. Here is an example of one of our many full page ads in the Certified Coin Dealer Newsletter, which we placed over the years. We buy and sell proof gold, mint state gold, gold commems and early gold. Be sure to view our inventory of Rare Coins. 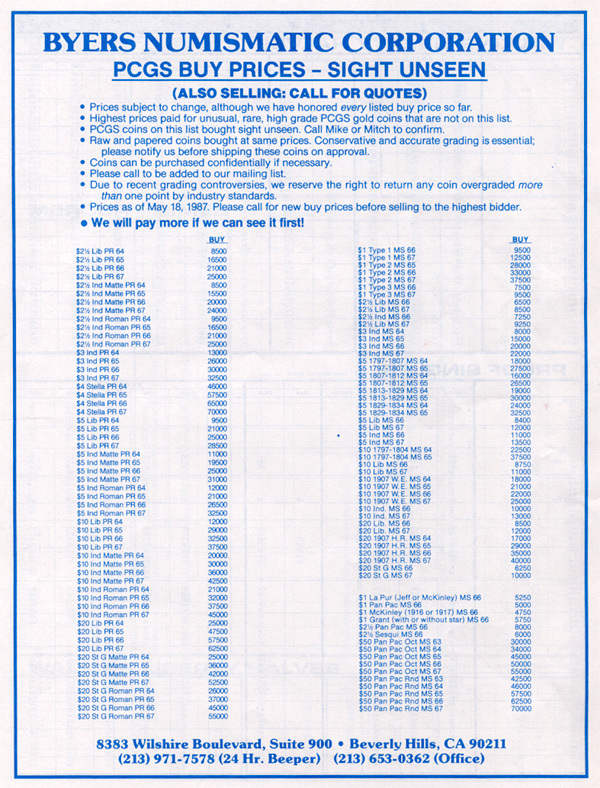 From 1974 - 1978 I mailed out over 25 price lists of major mint errors. My all time favorite was my first catalog which was photographed, printed and distributed in 1975 by John Devine (Lonesome John) from Newbury Park, CA. It was a 26 page catalog containing the finest major mint errors with photographs, descriptions and prices.